Ring in the new year with Uchinaanchu (Okinawan) spirit! 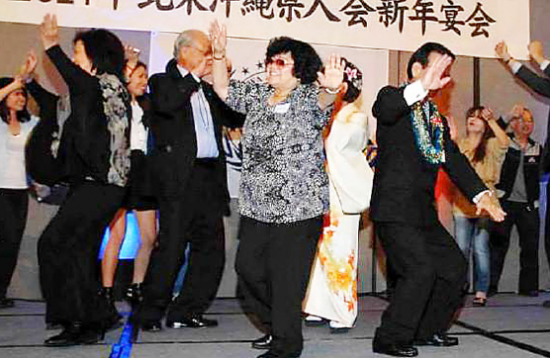 The Okinawa Association of America (OAA) will host its annual New Year’s Party on Sunday, Jan. 17. Held at the Quiet Cannon banquet hall in Montebello Golf Course, this event is one of the OAA’s largest with over 600 attendees. Pre-registration is required to attend. Deadline is Friday, Jan. 8, to guarantee a ticket at current pricing. The $40 admission fee includes a prime rib entrée (vegetarian menu available). To help families and encourage younger members to attend, discounted fees are available for children (ages 3 to 10) and students (ages 11 to 18). One of the event’s biggest draws is the entertainment program, which will showcase the cultural arts of Okinawa, Hawaii, and Japan. Featuring live music, dance, karaoke, and martial arts demonstrations, highlights include a classical Ryukyu music ensemble, the L.A. branch of Ryukyukoku Matsuri Daiko (Okinawan drum-dancing), and surprise numbers performed by the OAA’s Board of Directors and Women’s Club. Support the OAA by purchasing $2 raffle tickets (winners need not be present) and try your luck at winning the grand prize: a Kangen Water ionization machine generously donated by Enagic USA Inc. (retail value: $1,480). Other prizes include round-trip airfare to Tokyo (fuel surcharges and tax not included) donated by Uyehara Travel, $200 travel vouchers donated by IACE Travel, gift cards, and electronics. For more information or to register for the event, contact the OAA at (310) 532-1929 or [email protected] Registration is required in order to attend. After the deadline, tickets are an additional $10 per person if space allows. Seating is assigned on a first-come, first-served basis.